While I was running errands for Mom, this morning, I had to pick up a few things at Food Pyramid. Just as I was leaving the store I was approached by an elderly gentleman wearing a John Wayne T-shirt, a Korean War Veteran ball cap, and holding the latest issue of TRUE WEST magazine. He didn't seem to be in a very good mood. When he got inside my bubble he asked somewhat gruffly, "You got a minute?" 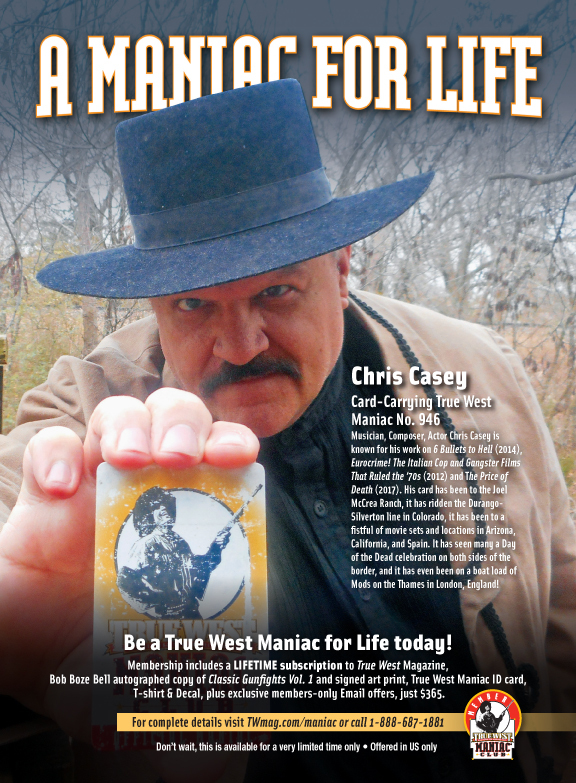 The man flipped the magazine open and landed on the full page True West Maniac ad featuring my repellent mug. "Yeah, that's me", I confessed. I jokingly followed up with, "How'd you recognize me without the hat and the mustache?". "Ugly is still ugly", said the old man flatly. "Next time you talk to the True West people", the man grumbled, "Tell 'em you spell carrying c-a-r-r-Y-i-n-g, not c-a-r-r-i-n-g". The gent was referring to the typo in the ad of which I was already aware. But, I played like I was shocked. "Is that right? That's how you spell it?" The old man finally cracked a smile. "You're puttin' me on, now, ain't you? ", he said with a chuckle. "Gettin' me back for that 'ugly' crack, huh?" The old gent stuck his hand out, we shook, and he said, "Pleased to meet you, Maniac". End of Chris Casey's travelogue. By the way, Chris lives in Oklahoma. Note that we actually spell-checked this version of the ad. Don't know who to contact for a Maniac picture.... My name is J.W. Atkinson ..True West Maniac # 81. Hastings, Minnesota. Cowboy Action Shooter... 50's and 60's Western lover... 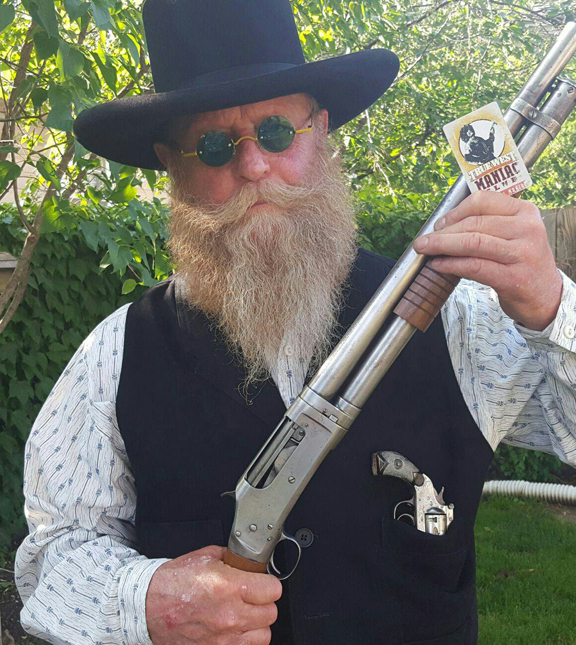 Retired and married to a school marm...owner and operator of Hastings Firearms...( yes I sweep out the place!) Love your mag !